With a fast-growing population, Longmont and Boulder County were in need of a new hospital to serve residents. 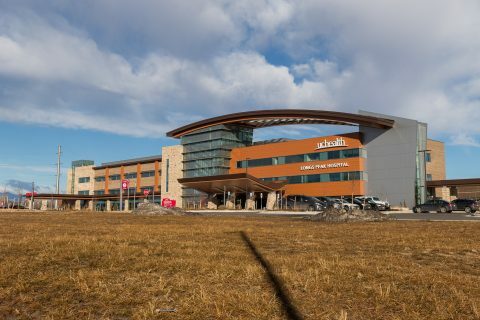 UCHealth recognized this and last August opened Longs Peak Hospital. Haselden Construction, one of the premier contractors in Colorado, was tasked with building this 21st century medical facility. Partnering with Haselden, Colorado Doorways provided a full suite of architectural door products and services. As with virtually all of our projects, we provided the hollow metal doors and frames, wood doors, architectural hardware and keying. This included unique patient room bathroom barn doors and auto operators throughout the facility. All told, approximately 650 openings were provided by Doorways. Beyond the products, Doorways utilized our complete array of services. Our Shop Applied Hardware Department installed the hardware on the doors before they even shipped to the site. Our installation teams then took it from there providing final installation in the openings. The UCHealth Longs Peak Hospital project really drives home that there is no limit to Doorways’ capability to provide the full range of door products and services, no matter how big the project. What can we do for your next project? Let us know!